The reservoir is simply a large container used to hold the water. It needs to be at least 1-foot deep to accommodate root growth, opaque to prevent algae growth, and sturdy. A common D.I.Y solution is a 14-gallon Roughtote storage bin. You can also build your own reservoir (a wood box lined with plastic works fine) or purchase one at your local grow shop or online. You will also need to purchase the proper nutrients and equipment for monitoring the pH level of the water. The raft consists of a rigid styrofoam platform cut to fit the size of the reservoir and fitted with “net pots.” Net pots are simply plastic containers with perforated bottoms that you put your growing medium and seedlings in. They can be found online or at any grow shop. The net pots are filled about 3/4 full with a growing medium such as Coconut Coir, Perlite, or LECA (clay balls, also called Hydroton), and the seedlings are planted directly in the growing medium. An aerator is needed to aerate the water and make sure that the nutrients in the water do not become stagnant. The easiest and most common choice is an air stone, which can be bought at any hydroponics or aquarium supply store. 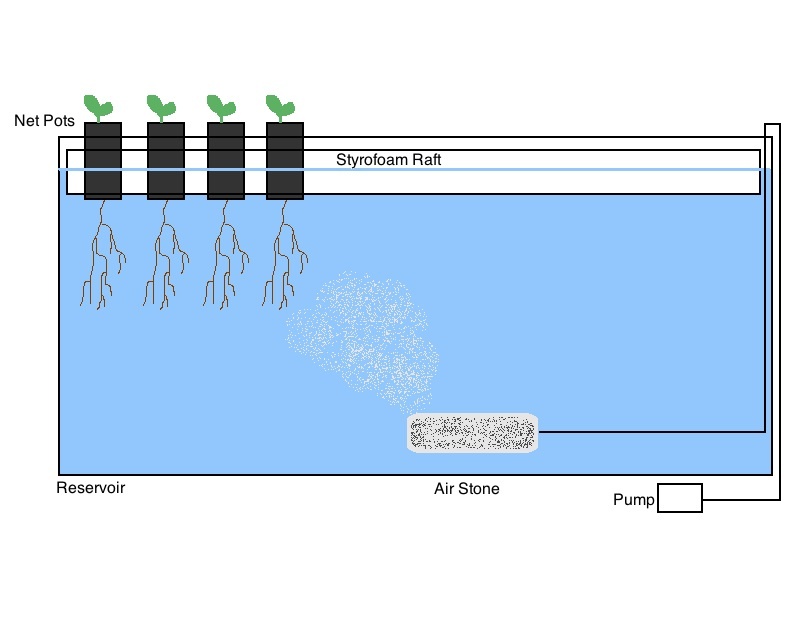 The stone must be hooked up to a small single outlet air pump, which is connected to the stone via air tubing and sits directly outside of the reservoir. Based on the name, you might think that lettuce is the only thing you can grow in a lettuce raft. The truth is you can grow almost any lightweight crop in this system. Lettuce and other leafy greens are the easiest and most straightforward, and their short growing time makes them ideal for a beginner project. Herbs are also an excellent choice; parsley, dill, chives, and basil grow easily in a lettuce raft system. Some other lightweight options include endives, watercress, cabbage, hot peppers and bok choy. Even though hydroponics systems are most often used to grow foods, you could also plant a small indoor flower garden using this method. You want to avoid heavy plants or those that need extra support in this type of set up. Some examples of plants to avoid are melons, tomatoes, beans, cucumbers, or sweet peppers. The lettuce raft system is often called a “living salad.” They will continue growing almost indefinitely. It is important to remember to plant seedlings, not seeds, in a water culture garden.The roots need to be long enough to reach the water immediately after they are planted, or they will not survive. The lettuce raft method is the most straightforward method of hydroponics out there. It is simple and inexpensive to set up, easy to maintain, and leaves plenty of room for experimentation.